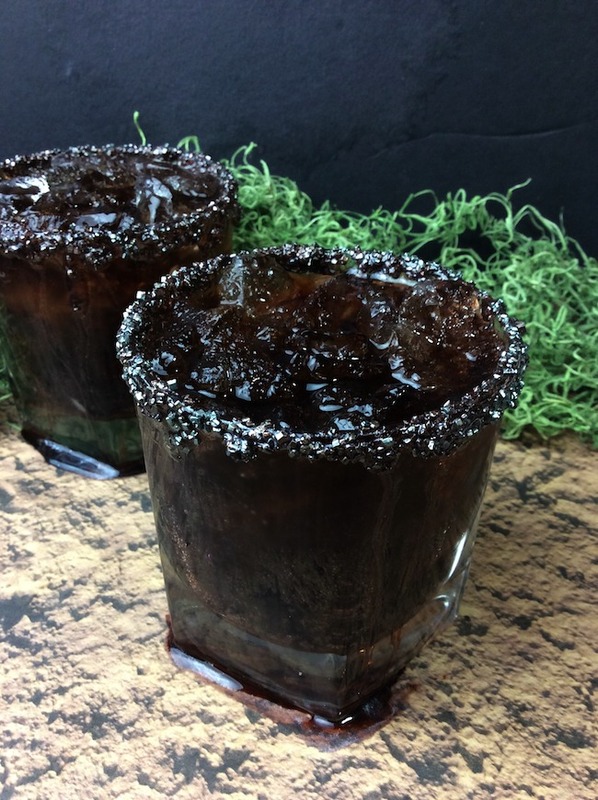 The Mater Oil Slick Cocktail Recipe is brought to you by Just Plum Crazy. 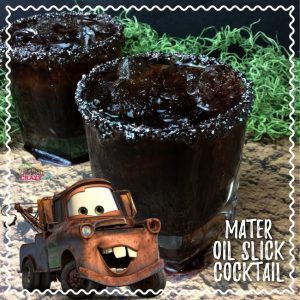 Mater Oil Slick Cocktail Recipe! 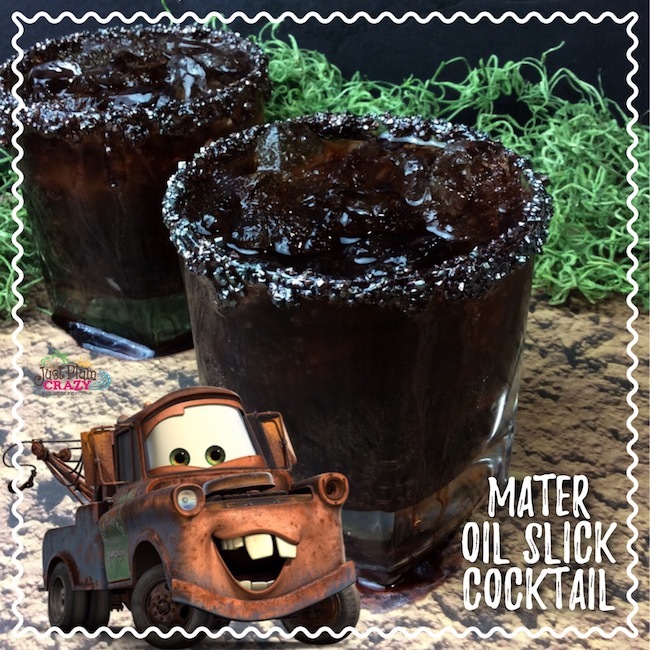 Since we just shared a Lightning McQueen Cars Oreo recipe and Lightning McQueen Cars Cupcake recipe, how about we make some Mater recipes? 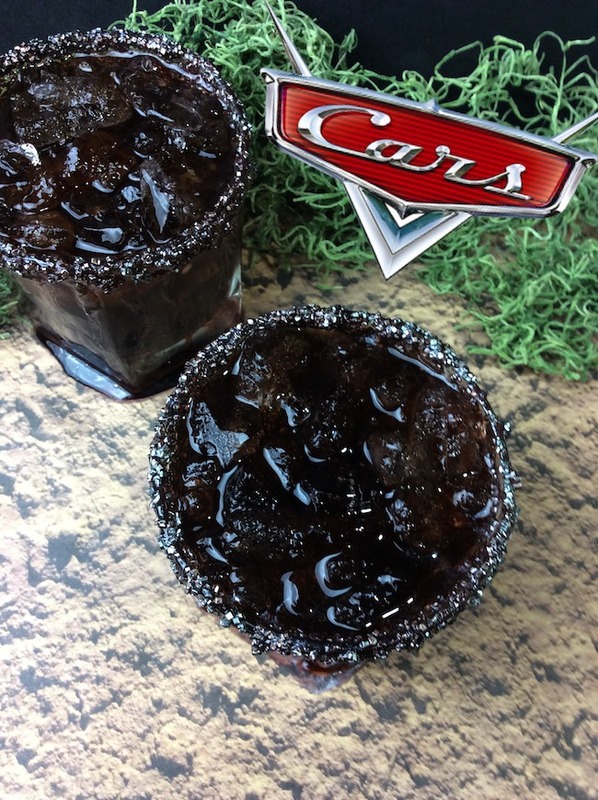 We have a Mater Oil Slick Cocktail recipe to share with you today. I love the Cars 3 movie. Have you seen it yet? 1. The dramatic, slow-motion crash scene in which Lightning McQueen hits a wall and rolls several times takes 24 seconds. 3. Lightning McQueen made his rookie debut in “Cars” in 2006; more than a decade has passed since he was a young superstar. CARS 3 (Pictured L-R) – Guido, Sally, Sarge, Mater and Luigi. Disney•Pixar’s “Cars 3” opens in U.S. theaters on June 16, 2017. © 2017 Disney•Pixar. All Rights Reserved. 1. Add simple syrup to a plate, set to the side. 2. Add grey cake sprinkles sugar to a plate. 3. Then roll rim of the glasses in the simple syrup then into the grey cake sprinkles. 5. Fill your glass with 3-4 pieces of ice. 6. Add your cherries to the glass and using a muddler or a spoon much the berries into the ice. 7. Now fill the glass with more ice to the top. 8. In a large bar shaker add your liquors and shake to combine. 9. Pour your liquor mix into the glass and then top with Coke. 10. Enjoy the Oil Slick! Add simple syrup to a plate, set to the side. Add grey cake sprinkles sugar to a plate. 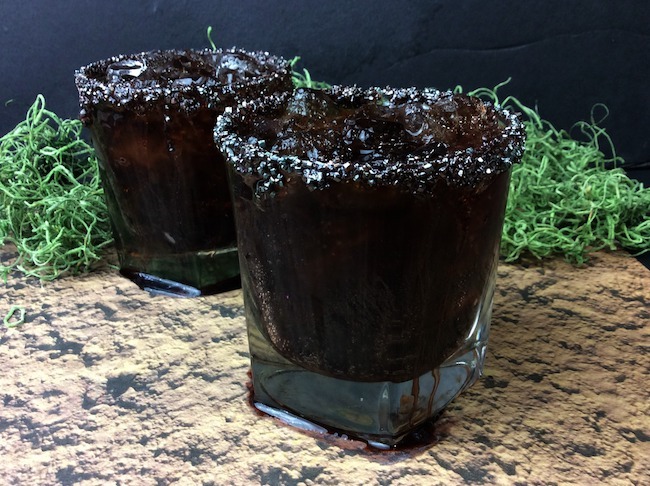 Then roll rim of the glasses in the simple syrup then into the grey cake sprinkles. Fill your glass with 3-4 pieces of ice. Add your cherries to the glass and using a muddler or a spoon much the berries into the ice. Now fill the glass with more ice to the top. In a large bar shaker add your liquors and shake to combine. Pour your liquor mix into the glass and then top with Coke. Be sure to pin it for later and follow us on Pinterest. CARS 3 is now playing in theatres everywhere!